Warm air or radiant? Oil or gas? We offer a free site survey and advice on designing the system characteristics to your preferential requirements. We will discuss the various options available to you and advise on the most cost effective whether it be warm air - radiant - suspended - floor standing - natural gas - LPG - oil fired etc. The most widely used form of industrial heating is Warm Air which works by passing the air within a building over a heat exchanger, heating it and then distributing it evenly throughout a building. Ducting can be installed to direct heat into separate areas or similarly provide fresh air. It is suitable for warehouses, retail premises, showrooms, factories, workshops and many other commercial premises providing low capital outlay and energy efficient running costs. Heater outputs vary to cater for large or small spaces and are available as floor standing heaters or suspended heater types. 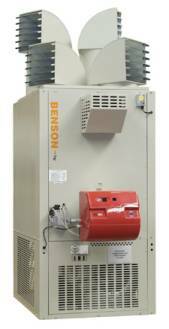 Room sealed heaters are available which are suitable for dusty or contaminated environments. below them, such as people and machinery. Heat can be directed and create spot heat to an area within a large building and is therefore ideal for larger, poorly insulated buildings and bay areas with high heat losses. 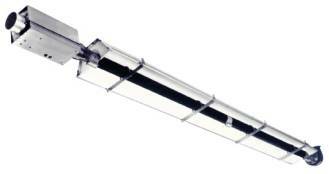 Heater outputs vary according to requirements and units can be suspended at various heights to suit. All heat loss calculations are carried out in accordance to the guide lines laid down by the Chartered Institute of Building Services Engineers (CIBSE) taking into account various building construction 'U' factors along with forced or natural infiltration rates in order to achieve an internal temperature rise assuming an external temperature of -1°C. Once our quotation is accepted we aim to commence the installation within two/three weeks of order. You will be informed of delivery and installation dates and every effort is made for our engineers to carry out the installation with as little disruption to your business as possible.